Every day companies are launching new apps to make the easiest payment method for India and other countries. The basic concept is to motivate people to opt for tools to enter the country in the digital era and save a tree because the tree is using to make paper. TEJ: Best Online System, Support, Safe Transaction And More! The online transaction saves money and effort. So, many countries adopted the electronic billing system. They are using electronic sources to keep the amount in the wallet. They convert the amount electronically and use the apparatus or device to pay a certain amount to the bank, shopkeeper etc. It is observed that Crypto Currency is used by the country to eliminate the traditional wallet system. What Is Crypto Currency and How function? Cryptocurrency is a digital instrument, which is the medium of exchange and that is using cryptography. That is used to control to generate additional currency by country. Cryptocurrency is a virtual currency, perhaps Bitcoin. The number of people did not understand the working process of virtual currency. This is another process to convert your wallet in electronic mode. That means you did not have money but have the capacity to purchase the product by virtual currency. Google has introduced new digital payment apps for the Indian Market. This is the new tools launched by Google to help India to speed up the Digital India concept. This Apps is using the National Payment Corporation Of India Unified Payments Interface. Google assured that payment will be very secure from this platform. The basic features of these apps can use to send money to your friends, receive payment directly in your bank account and pay to the shopkeeper on purchasing. You have to directly link your account with Tej Apps over UPI and can start to transfer money from bank to bank. Google Tej Shield assured to secure your transaction. Your small and big transaction of money will not disclose to anyone. Tej cash mode provides the facility to send and received money to any person without sharing any personal details like your bank account and phone number. These security features are unique and will attract people. The facility will improve in coming days to pay through debit and credit card on Tej. Google will add additional features to pay the utility bill through Tej and receive the reminder. Presently this app has been added to 55 banks in India. When you want to use this app, first open Google Play store and download directly in Smart-phone. During setup, you get an option to select the language as per your region. Next, you have to provide a mobile number, which is directly connected to your account. This app will link your account to the Google account. When you gave your number, they will send the OTP password for verification. They also provide to set lock by Google PIN or Screen lock. Now choose your bank to link for UPI transaction. If you are already linked with that then they will demand PIN number. After that Tej will create VPA with your name with the support of your E-mail Id. At the time of Payment to a person, you have to Tap on the name of the receiver. To start the payment to a certain person, you have to add his account number or IFSC code, UPI ID, QR Code or phone number. These are the easiest step required to process the request from TEJ Apps. You can transaction from Rs, 50/- and more as per Terms & Condition. Read the TOS carefully before using these apps and follow the rules and regulation. This is one of the best tools for people to transfer money online and offline. The government of India launched BHIM and Google Provided TEJ apps. Both are good and secure for a transaction. 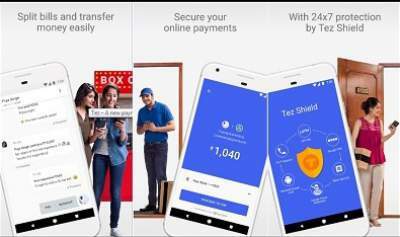 The best line should be added here that people know about the good security system of Google and TEJ is using this platform, So your transaction gets more security on this platform 24X7. You should take care to generate OTP. Don’t share this code with anyone and be careful to use the phone. Use the locking system to save your data and nobody can misuse or cheat if your phone lost. These tools are the next label support of Digital India.